The new Teen Titans series is definitely focussed on DC's younger generation - besides all the usual teen sidekicks, the villains are getting younger, too. Deathstroke's got a new Ravager and even old-time Titans foe Brother Blood has received a new, teenaged incarnation. The charismatic cult leader possesses the power yo absorb a man's essence with a single bite. Armed with a hatred of the Teen Titans, Brother Blood seeks to rule the world! Never having really been much of a Teen Titans fan, I didn't know who Brother Blood was before he showed up on the Cartoon Network series. I knew his name, vaguely, but that was it - BB's never been one of the DC Universe's major villains. However, he's drastically different on the cartoon than in the books, so he remained a mystery. Introducing the comic's blue-skinned vampire didn't help anything, either, so here's a quick recap. The original Brother Blood was a 13th-century Christian priest named Brother Sebastian who gained invulnerability and near immortality, but was cursed to be killed by his son before he reached his 100th birthday. The cursed continued, so that the Brother Blood who faced the Titans was the seventh. He was defeated for a time, but was just about to make his big comeback when he was killed by the eighth. Brother Blood's costume is interesting, to say the least. It's got a red torso and blue sleeves with large black stripes running down the limbs, and a few gold-trimmed bands, belts and boots. Though it seems quite distinct, it's got a stylistic relation to the original red and black BB suit. No explaination for the powder blue fleshtone, though. He wears some sort of beast skull on his head, and he's got a light brown cape. Actually, that cape is the source of Brother Blood's powers (at least it always was before) and also happens to be the prayer shawl of Christ. I suppose if Jesus could heal the lame and make the blind see, then he should be able to give a healthy man superpowers. That's good doctrine, right there. Brother Blood has the standard DC Direct articulation: neck, shoulders, elbows, hips and knees, though he also gets the ultra-rare bonus of wrists. The sculpt makes him out to be fairly muscular, which makes sense for a guy empowered by God's soiled gym towl. His "skulmet" just breaks the 6" mark. 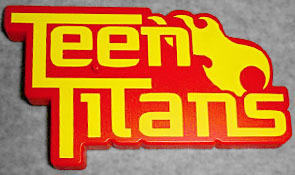 All the Contemporary Teen Titans figures come with a logo base that cleverly doubles as the series logo on the cards, but Brother Blood is the first character who needs the base to stand. His legs are slightly different lengths, which is supposed to give him sort of a striding pose, but really just makes him unstable. On the plus side, the base holds him well and looks decent beneath him. Brother Blood is a nice figure, but now we really need a Contemporary Teen Titans Raven to go with him. What's the wackiest bit of religious apocrypha ever adopted into a comicbook? Tell us on our message board, The Loafing Lounge.